I made it! I sit this Monday evening on the veranda of a coffee house in Eilat, enjoying the evening breeze and looking across the Red Sea at the lights of Aqaba, Jordan. I surprised myself and bicycled 330 miles to get here, and though I’m tired I actually have worked myself into better condition over the course of the week. Here is a final installment on my journey. I love soaring downhill on my bike. I have loved it as long as I can remember. I’m willing to bike uphill just to get to the downhill. And there were some really big, long hills to climb up and coast down in the Negev, along with good air and wide-open desert scenery. Flocking along with the group, I pushed myself to speeds I didn’t think I could sustain, drafting behind other riders and taking their encouragement. During the first four days I chose to ride with the fastest group, and just kept pedaling. Today I cut myself a little slack and joined the middling riders, opting out of a brutal climb that was part of the fast group’s itinerary. During one seven-mile downhill stretch (! ), the wind in our face was so stiff that we had to pedal downhill. That trip was a planned detour to a kitschy desert rest stop, so we returned the same way as we came, only this time with the wind at our backs. And now we sped uphill, with minimal effort!When a truck would pass us from behind, the wake of air currents that were stirred up behind sucked us along momentarily on our bicycles, while a truck coming from the opposite direction pushed through the air and the air pushed us backward. I learned how to ride in a line with other cyclists, and their bodies and momentum created a windscreen for me and I cut through the air while the lead rider took the brunt of the wind. I “saw” that we live in a sea of air. The air, though unseen and not nearly as substantial as water, has real substance. Powering my bike with only my own muscles, so exposed and at the mercy of the currents and the swirls of wind, I could see in my mind’s eye this ocean of air that we inhabit. Late on Monday afternoon we descended an enormous hill from the Negev highlands into the Arava valley, and we rolled into Kibbutz Ketura for the night. Ketura is one of a consortium of 10 kibbutzim that occupy the Southern Arava valley, on the way to Eilat. The Arava is extremely arid and hot, and it has taken a lot of persistence and ingenuity to make these kibbutzim flourish. Kibbutz Ketura is worth describing. Ketura was founded in the 1970’s by a group of young, idealistic American Zionists who had grown up in the Young Judaea youth movement. They were joined by a similar group of young Israelis seeking to make the desert bloom and to live communally. As it happens, one of those early members, Richie Goldstein, is a dear cousin of WJC member Beth Abrams. Beth gave him a heads-up that I would be rolling into the kibbutz. Richie sought me out and invited me over to his veranda, where I spoke with him and his wife Ofra. Richie and Ofra have been members of the kibbutz for over 30 years – they met each other as young kibbutzniks – and have participated in every aspect of its development from a bare former army encampment into the green and flowering oasis that it has become today. Richie is now the comptroller of the date-packing plant that is run collectively by the area kibbutzim. Dates are the biggest cash crop of the area. Ofra is the gardener and arborist of the kibbutz, and the trees surrounding us were the products of her planting and tending. You may be aware that in recent decades most of the approximately 160 kibbutzim in Israel have given up their collective lifestyle and ideology and have privatized. These kibbutzim still have members, but the members now earn their own salaries and determine how to spend their own resources. Kibbutz Ketura is one of about 20 holdouts that remain committed to communal living.Everything is collectively owned and all salaries and income generated by the members go into a common pool. All decisions about the future of the kibbutz are made collectively. Richie and Ofra explained that the remaining communal kibbutzim were forming a federation within the larger kibbutz movement: the Federation of Communal Kibbutzim. Since “kibbutz” means “commune” or “collective”, it is an ironic redundancy that these remaining communal kibbutzim need to identify themselves as such. Listening to Richie and Ofra, it appears to me that Ketura faces two main challenges: how to remain a collective while responding to members’ desires for increased autonomy, and how to make a living.The first issue is a perennial and difficult debate. The members of Ketura have given up personal property and the pursuit of individual wealth in favor of their dream of a different way to live and to share with people. They make this choice in a world in which socialism has been long discredited and in which individual mobility and choice is championed. For the members of Ketura, any decision to alter their communal agreement becomes an assault on their very identity, and discussions are heated. For example, would it be a slippery slope if members were each given a monetary stipend, and were permitted to spend it as they see fit? Which brings me to the second main issue: how does the kibbutz make a collective living? If the kibbutz were more prosperous, the ideological issues might relax somewhat – I don’t know. Since it’s founding, Ketura’s main sources of income have been agricultural: dates, vegetables and dairy products. The kibbutz members have assessed their skills and resources and have worked hard to diversify. Noting the number of educators on the kibbutz, the kibbutz has put much effort into the building of The Arava Institute and other educational endeavors. As we biked into the kibbutz we saw a huge array of pipes and grids; this, it turns out, is a method for producing and harvesting algae, which has a rapidly growing market as a nutritional supplement around the world. Could this be Ketura’s big break? In fact, Ketura’s greatest resource may be sunlight. The intense desert sun shines almost every day of the year. Richie explained that thanks to a fortunate confluence of political timing and international climate treaties, Israel’s government had given the green light to the Arava Power Company, and Ketura’s first 20-acre field of photovoltaic solar panels was nearing construction. This field would eventually be dwarfed by future arrays, and the Arava Power Company could become a major source of electricity for the south of Israel and for neighboring Jordan. I bid Richie and Ofra good evening and as I strolled back to my guest room I passed the dorms of the Arava Institute. The Jordanian, Palestinian, Israeli and American students sat in the grassy courtyard laughing and talking, a temporary idyll in a painful and dangerous world. 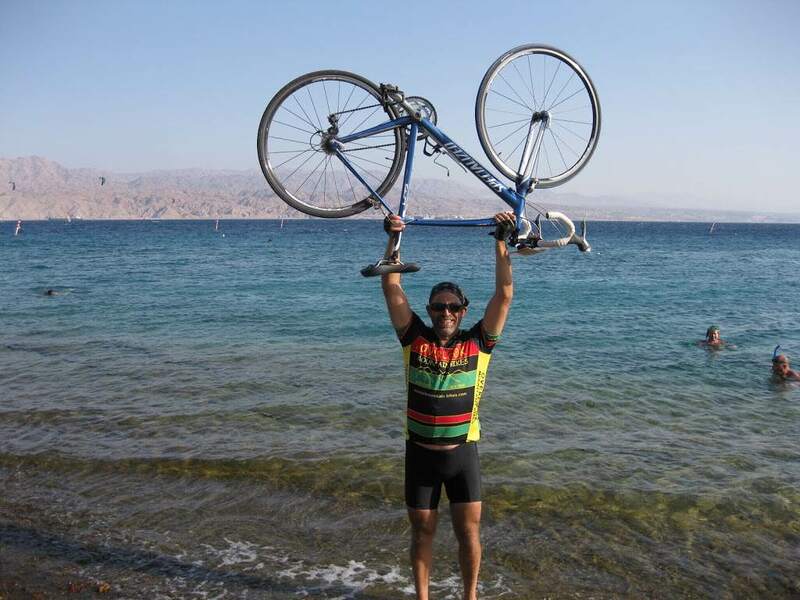 Monday morning we biked the final leg to Eilat. Lunch was served at the overlook on Mount Hizkiyahu. From this vantage point we could see the waters of the Gulf of Aqaba (also know as the Red Sea), and we could see the territory of four countries: Egypt, Israel, Jordan and Saudi Arabia. In Biblical geography, across the sea we were looking at the bare and jagged mountains of Edom and Midian. We then careened down, down, down to sea level in Eilat, and we waded into the Red Sea, our journey completed.